The American Health Council is honored to welcome Dr. Shervin Naderi to its prestigious Physician Board, in honor of his 19 years of service within the healthcare industry. After receiving his Bachelors & Masters Degrees from Boston University, Dr. Shervin Naderi proceeded to pursue his Medical Degree from the Medical College of Pennsylvania – Hahnemann University School of Medicine. Dr. Naderi continued to complete his General Surgery Internship followed by a vigorous surgical residency in the field of Head & Neck Surgery. Dr. Naderi became certified by both the American Board of Medical Specialties (ABMS) & The American Board of Otolaryngology. He advanced his training by completing a competitive and accredited Fellowship in Facial Plastic & Reconstructive Surgery at one of the most prestigious and highly sought after Fellowship programs in the country. Dr. Naderi then obtained his second Board Certification by The American Board of Facial Plastic & Reconstructive Surgery after which he served for many years as an Examiner for The American Board Facial Plastic & Reconstructive Surgery examining other plastic surgeons looking for Board Certification. Dr. Shervin Naderi, MD, FACS is the Founder of The Naderi Center for Cosmetic Surgery Specialist with offices in Chevy Chase Maryland and Reston Virginia. The Naderi Center is a very unique cosmetic surgery practice in the United States. Within the center, each Board-Certified Surgeon specializes and focuses on a small handful of procedures and surgeries that they are highly skilled at and carry out meticulously, proficiently and frequently. The Naderi Center is the perfect example of ultra-specialization where a team of surgeons work together to offer patients the best of the best rather than a “Jack of All Trades” approach. The surgeons specialize in different aspects of facial and body plastic surgery as well as lasers and medical skincare. On a day-to-day basis, Dr. Shervin Naderi provides consultations with new patients and follow ups with previous patients, as well as performs Rhinoplasty in the operating room and non-surgical rhinoplasty injections in the office. Dr. Naderi trains and mentors clinical staff and has long created a comprehensive source of online educational videos for use by doctors all over the world. 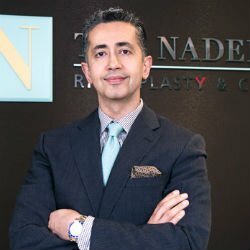 Dr. Naderi has been internationally recognized as an Instructor and Master Injector for Advanced Botox and Filler injections and gets requests by international doctors and surgeons who want to come observe his techniques. He used to be involved in the training of surgical residents at the Indiana University School of Medicine Department of Head & Neck Surgery in the forms of Facial Plastic Surgery and Rhinoplasty. Dr. Naderi is recognized as one of the top 25 injectors in the entire United States. He is the only surgeon in the United States who performs only and exclusively one surgery – Rhinoplasty and as such patients fly to him from all over the United States and abroad for rhinoplasty and even advanced Botox and Filler injections. Over the course of his illustrious career, Dr. Naderi has been awarded a many professional honors, including being named New Beauty Top Doctor in 2016 and Expert Injector in 2016 and winning numerous other awards and recognitions as Top Doc. Dr. Naderi is extremely proud of the connection he has with his patients. The Naderi Center is a boutique concierge practice with outstanding customer service where no one is ever rushed and everyone is treated like family. Dr. Shervin Naderi believes his career successes are due to his training at the most prestigious residency and fellowship programs many year ago followed by his decision to focus exclusively on Rhinoplasty and Facial Injections. While initially he started the center focusing on solo practice he brought on Dr. Jessica Kulak for her expertise and specialization in facelifts and facial contouring followed by adding Dr. Erica Anderson for her expertise and specialization in Breast and Body Plastic Surgery. Over the next five years, Dr. Naderi aims to add more specialties to his practice such as Hair Transplant and Dermatology. The Virginia location is also going to relocate into a brand new state of the art facility inside Reston Hospital with surgery center and spa. The center also offers medical aesthetic and skin care products and services including lasers and peels by licensed and skillful providers. The Naderi Center for Rhinoplasty and Cosmetic Surgery is the most specialized and unique Plastic Surgery practice in the United States. The Naderi Center for Cosmetic Surgery has 3 Board Certified Surgeons that focus exclusively on specific and different areas of cosmetic surgery. They are recognized as true masters in their field by both physician colleagues and patients.